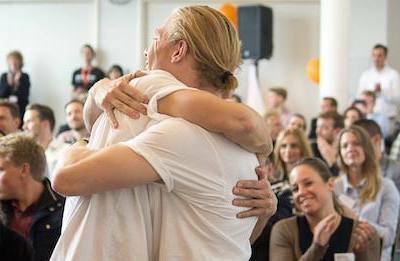 This September, the 12 startups from Iceland, Norway, Sweden, Finland and Denmark in the Nordic HealthTech Talents program* were gathered in Copenhagen to learn about personal leadership. Leading a startup is not an easy task. The leaders have to manage rapid changes, complicated situations and a high degree of uncertainty within the professional and personal area while building a company. Personal leadership skills can be a fundamental factor that determines success or failure. To help the co-founders better prioritize and communicate in both business and life, the program aims to focus on their individual leadership skills and help shape them to become a leader of tomorrow. Morten Ugelvig Andersen, CEO at Venture Cup Denmark, Anders Heebøll-Nielsen, Patent Expert at AWA, Stephan Christgau, Senior Partner at Novo Seeds and Jes Broeng, founding member at DTU entrepreneurship and serial entrepreneur, kicked off the first day of the intense and exciting program. VasDeBlock medical ApS develops a new and innovative male contraception method for couples around the world. It doesn’t hold hormones, it doesn’t require surgery, it’s far more practical than condoms. And it’s reversible! Check out more here. Jannick B. Pedersen, CEO at FranklinCovey Denmark introduced ‘The 7 Habits of Highly Effective People’, a proven personal-leadership system to integrate motivation, priorities and time management structurally into your daily life as a leader.FranklinCovey is a global company specializing in performance improvement based on timeless principles of effectiveness. The first part of the workshop was about discovering and prioritizing the relationships and tasks in their personal and professional life with a proactive approach. “It made me reflect on myself, my goals and my relations, which is something I usually don’t spend enough time doing.” said Love Marcus, Co-Founder of Provement. Provement is a digital evaluation and communication tool that helps clinicians individualize childhood obesity treatment and make it more effective while reducing the clinicians’ workload and the families’ perceived effort. Check out more here. “I learn how to sharpen my focus, listen to others, and prioritize better in a busy life. I also loved the positivity, micro-pauses and the emphasis on good sleep.” – said Margret Jonsdottir, CEO of Selective Humans. Selective Humans provides a solution that enables users of the service to scan the barcode of pre-packed food and food supplements to identify and select or avoid selected ingredients in a fast and simple manner. Check out more here. The second part of the workshop helped participants to create their daily private victory by adopting the habits and keeping a win-win situation in mind. TresActio makes biotechnology research faster and more efficient by digitizing early stages of the strain screening pipeline – adding automatic control and collecting data at an unprecedented scale. Check out more here.